When it comes to racy small hatchbacks, the brand new Kia Proceed GT has to be about the most capable, value-for-money, package of fun that you can get on four wheels. With 150 kW under the hood, this is a seriously fun FWD little machine that Kia has created. Where the fun starts is when the ignition of the new 1.6-litre GDI engine fires. A throaty tone is emitted from the dual exhaust pipes, and a crisp response to any accelerator pressure hints at the driving fun to be had. There is a healthy 265 Nm of torque available, and the link to the torque is via a nice shifting six-speed manual. Kia claim the new Kia Proceed GT can hit 230 km/h on the right piece of road, while the 0-100 km/h sprint can be completed in under eight seconds. These figures, alone suggest that the drive will be rousing, and I’m sure the competition are sitting up and taking notice at this point. Out on the road, the Kia Proceed GT has been given a stiff suspension for holding the little hatch close to the road and level. Accurate steering is power assisted, and the Proceed GT performs nicely over varying road surfaces. Plenty of rubber is in contact with the road, as the Proceed GT comes with 18-inch alloys. The alloys look amazing, and set off the car beautifully. One of the notable delights about driving the feisty little Kia Proceed GT is that the act of driving is very easy, everything feels as if it’s in the right place. The easy-to-read and easy-to-use centre console aids driving pleasure. 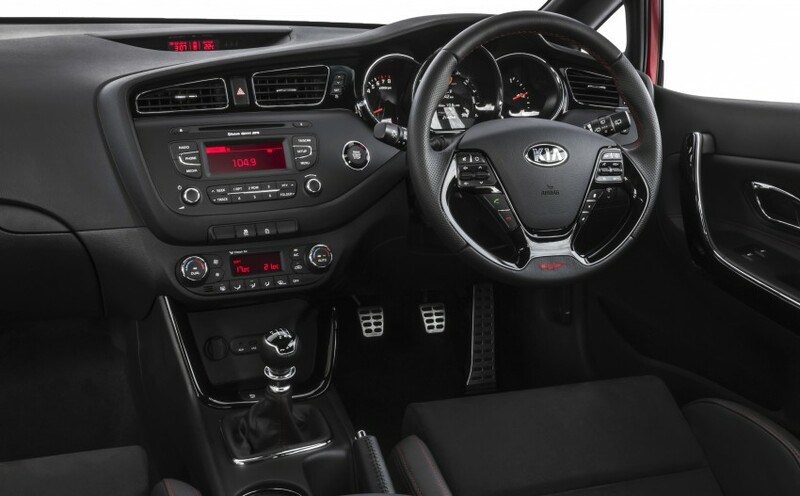 Enter into the world of the Kia Proceed GT, and the entry through the doors is wide and easy. Kia Proceed GT cabin impressions consist of sound ergonomics, good comfort levels and easy-to-read switchgear wrapped up in sporty dressing. There are plenty of racy accents to match the racy attitude of the new Kia Proceed GT. Alloy sports pedals, interior chrome highlighting, a panoramic sunroof, and appealing Recaro Sports seats garbed in leather and suede. The Kia Proceed GT is a well-equipped car. Electric windows, a six-way powered front driver’s seat, driver and passenger sunvisors with illumination and vanity mirrors, map pockets and bottle holders in the front doors, a cooled glovebox, an MP3 compatible CD player with AM/FM tuner, six speaker surround sound and an AUX/USB input with iPod compatibility are all features that enhance the drive. When it comes to throwing in the luggage for the weekend away, there is 380 litres of space in the boot with the rear seats up. Split folding rear seats mean that the luggage space can grow humongously at the expense of rear seat accommodation for occupants. I’m impressed with all the storage compartments around the cabin. It really cleans up a well-used car’s interior when all the bits-and-pieces are organised and stored away from sight where they don’t get in the way. Communications seem to be so essential in today’s world, and that’s why Kia have their cars kitted out with a Bluetooth system that has both a phone and media stream function. Steering wheel mounted audio and Bluetooth controls make life nice and easy for altering the sound – and keeping up with communications. The Kia Proceed GT also comes with Speed Dependent Volume Control as standard. Dual-zone climate control masters your preferred cabin temperature, while the clean air module ensures that the air you breathe is clean and fresh. A clever automatic defog system is really useful when the weather gets damp and cold. Premium active and passive safety features have given the Kia Proceed GT a coveted five-star safety rating in ANCAP crash testing. In the frontal offset crash test, driver chest protection was acceptable. Passenger chest and leg protection was acceptable. In the side impact crash test driver protection was good. Head protection in the side pole test was also good. ABS, EBD4, BA5, ESC, TCS6, Vehicle Stability Management, Hill-start Assist Control, reverse parking sensors, a rear view camera with parking guidelines, quad LED daytime running lights, dusk-sensing automatic headlamps, child restraint anchorage points, driver and front passenger SRS airbags, front side SRS airbags for the head and thorax, curtain SRS airbags for rear occupants, front seatbelt pre-tensioners with load limiters and side door impact beams are some of the superb safety items. On the outside, the Kia Proceed GT looks very sharp indeed. This latest Kia offering is in keeping with the very classy designs that Kia has been pumping out – award winning designs, too! Exterior looks draw attention, particularly with the car’s flowing curves and quad LED Daytime running lights. The car’s spoiler and side skirts look superb. Kia has attracted a wide following since their arrival to the car manufacturing scene. 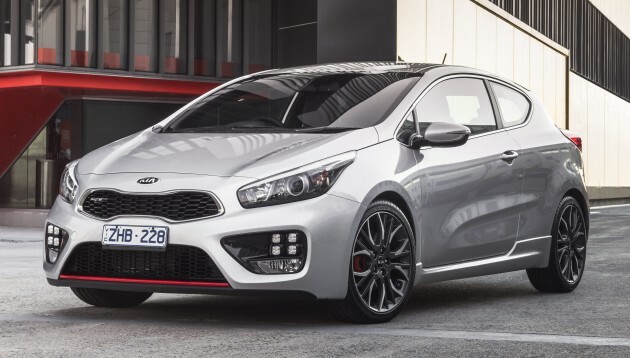 Their new Kia Proceed GT has youthful styling and all the latest in advanced technologies. Make your day, a five year/unlimited km warranty is part of the Kia Proceed GT packaging, and that can’t be bettered. Be a part of the new auto uprising and drive Kia. For any more information on the Kia Proceed GT, or for that matter any other new car, contact one of our friendly consultants on 1300 303 181. If you’d like some fleet discount pricing (yes even for private buyers! ), we can submit vehicle quotes requests out to our national network of Kia dealers and come back with pricing within 24 hours. Private Fleet – car buying made easy!